Do you remember eating cheese crackers as a kid? Or should I say cheeze crackers? Would that jog your memory? Opening that red cardboard box and tearing through the brown, waxy paper with dots of grease on it was something I enjoyed. Maybe a little too much. Cheese crackers were one of my favorite indulgences and one of the main reasons I put on a few extra pounds in junior high. Plus there were these huge, soft chocolate chip cookies in the cafeteria... These days, I rarely let myself eat things like that. Mostly because once I start, getting me to stop is like standing in front of a raging freight train; nearly impossible unless you’re a super hero. But I also avoid them because of simply not knowing what on earth is in there. What did they do to give them that radioactive orange glow? And why, oh why, are they so addicting? This recipe may not solve any cracker-addiction problem you may have, but at least we know exactly what has gone into them. And there is no greasy, waxy brown bag inside a cardboard box to worry with. The color comes from two things: cheese (duh), and smoked paprika. I had the urge to make a sweetly smokey flavored cracker and the paprika- smoked paprika- made that possible while also adding to the lovely color. Brad and I were just talking the other day about how, when you visit a charming café on one of the side streets of Rome, it’s so nice when they bring a tiny bowl of salty potato chips. Not a massive, 2 bazillion calorie truck load of fried stuff that you might find here in the States. Just a small sampling to nibble on between sips of your Prosecco is all you need. These crackers would be perfect for just that purpose. They have so much flavor that you really don’t need handful after handful (although if that’s how you eat them I will not judge) and they pair beautifully with a nice, dry rosé, a bright, bubbly champagne, or a deep, dark Shiraz. Moments like these are well worth the wait. If you’ve been on the fence about trying to make your own crackers, I recommend taking the plunge. They are not at all difficult and the flavor is so much better- richer, deeper, cheesier- than the store-bought variety. And you don’t have to make them smokey if you don’t want to. Just omit the paprika if you prefer. I also think adding some fresh dill to the dough would make a nice, summery version perfect for parties and at-home happy hours. Recipe adapted from...wait for it... Tidy Mom who adapted it from In the Kitchen with Kath who adapted it from Smitten Kitchen ...Food bloggers UNITE! Preheat oven to 350 degrees. In a food processor, combine the shredded cheese, butter, flour, salt and smoked paprika. Pulse about 12 times, 1 second for each pulse, until the mixture resembles wet sand. Add the milk and pulse until the dough sticks together when you press it between your fingers. If it is too dry, add a tiny bit of extra milk until you get a nice consistency. 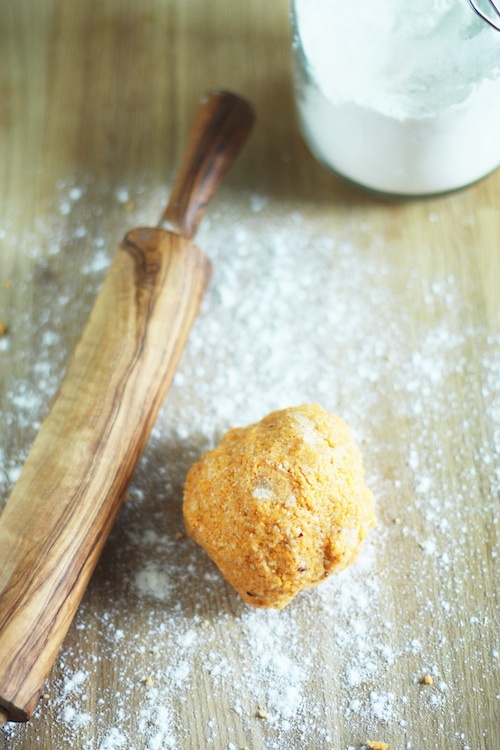 Turn the dough out onto a floured surface and, using your clean hands, form it into a ball. Flatten the ball just slightly to form an oval. Now, use a rolling pin that has been lightly floured to roll the dough into a rectangle. Using a pizza cutter and a ruler to help with accuracy, cut the dough into 1 inch squares. *The original recipe says to use 1 tablespoon, but I found my dough to be too dry with only 1. Start with 1 and add more if needed. *I had to bake my crakers a little longer to get them as crispy as I wanted- nearly 20 minutes. Keep an eye on them and remember that as they cool they will become more crisp.